I drove out to the Gloucester area for a ride in a SeaRey. 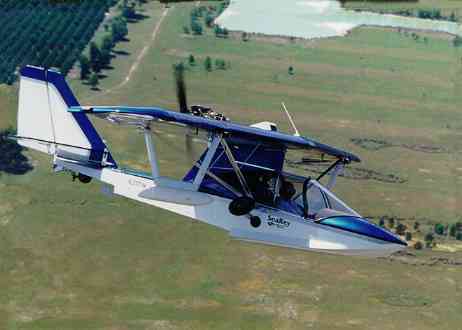 (It was a Kitplanes Magazine article about a SeaRey three or four years ago that got me thinking about flying. Here's one in the air over Florida. I had a demo ride in a SeaRey 15 months ago, at the factory in Orlando, but back then I'd only flown a 152 and wasn't really able to assess what kind of airplane the SeaRey is. So I've been looking for an opportunity to go up in one again. This SeaRey's owner, Mike, and his wife, Beverly, live on the Chesapeake Bay at 7 feet MSL, a few miles north of Norfolk. It's just a terrific location (if you like salty water, of course). They have 30 acres of mostly marsh land, with two places high enough to build on and one high enough for a septic field. So far, they've built a large garage with an apartment above it. Mike also just finished building a hangar for his SeaRey. There's a 300 foot pier out into water deep enough for the biggest of their five boats. There's a boat ramp, too (I'll get to that in a minute). I arrived at about 1:15. Mike and his cream-colored Chesapeake Retriever (what else on the Bay?!) came out and we got acquainted. Then Mike walked me around to the other side of the large garage-under-house-over, and there on the lawn was a white and blue SeaRey. We climbed in--you just stand beside the seat, lift your foot over the side, and step in. You sit down in a SeaRey: your bottom is at most two feet above the ground. Mike went through his checklist and I was amused when he set the altimeter to 0 feet--no doubt about that! 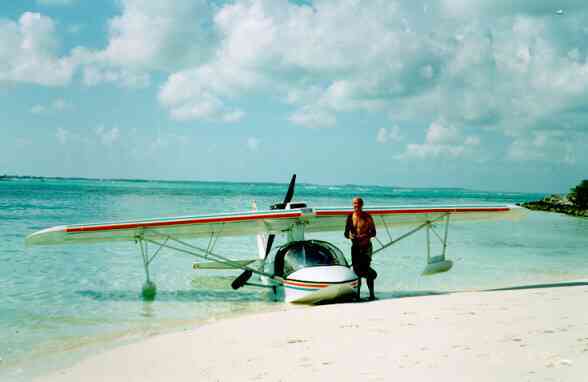 He started up the 80 hp Rotax 912 and taxied across the grass to the boat ramp and down into the water. He raised the landing gear, and with the canopies still open, taxied out into the "creek" (which you and I would call a bay) and about a quarter mile downwind, taxiing with the hull in the water while the engine warmed up. Then he turned into the wind and we closed the canopies. (You can fly with them open, but there's some splashing on takeoff.) He added 20 degrees of flaps and opened the throttle. The four-cycle, four cylinder Rotax wound up to 5800 rpm and although the exhaust sound was barely noticeable, the prop started humming. It's geared about 2-to-1 (I think), so it sounds like it's on a normal airplane with an 8 cylinder engine--except. of course, that the engine is behind the wing, so you can't see it at all. We were up on the step almost immediately and off the water in about 300 or 400 feet. Climb was at 500 fpm. At 700 feet above the very visible sea level, he throttled back to 5000 rpm, trimmed it up, and let me fly it. I immediately found that it was hard to figure out where to keep the nose against the horizon--because there's almost no nose visible. Eventually I got the hang of that and was able to keep it straight and level and to do turns without drifting up and down too much. It turned out to be easy to fly. The only thing I hadn't remembered from the demo flight in Florida was that the aileron control pressure seemed a bit heavy and the ailerons seemed a little stiff. The elevators seemed light enough. The electric trim was fast and took some getting used to, but wasn't a problem. After I'd done a bunch of turns and had just flown around for about 20 minutes, mostly gawking at the scenery--WOW--we headed back to Mike's creek. He took over on downwind, reduced power to about 2500 rpm, turned base and then final. At about 10 feet above the water, he added some power and flew it down until the step made contact. Once we were firmly on the step he cut the power and we transitioned smoothly to displacement mode and became a boat again. He motored up beside a floating pier and broke out a paddle. Now, here's the one thing I don't like about the flying boat configuration. It's a high-wing airplane, but the sponsons and struts prevent you from getting the side of the airplane close to the side of a lot of docks. You can nose in to the dock, of course, but you can't climb out over the nose. (I wonder if that could be done with a little stiffening beneath the fiberglass.) What you have to do is sidle up with the side of the nose to the end of the dock, so you can get out. Mike's floating dock is low enough, however, so that we could get close enough to the side of it to get out. Mike noticed that the tide was going out earlier than he'd thought, so it was soon time to taxi back up the ramp onto the lawn. At low tide, the water is still deep enough to float the airplane, but the gear contacts the muddy bottom, he says, and gets stuck. So he fired up the engine and taxied up the ramp and onto the grass. Then we had to sit on the second floor front porch and admire the view--water on three sides. Pretty soon a helicopter--a two-place Robinson R22--flew up, hovered while the pilot looked over the distance between some trees, and then landed far enough from the SeaRey so that the rotor downwash didn't bother it. The rotor is only about 20 feet, or so, and the wash just stayed in quite a small torus. He landed on a patch of bare ground beyond the lawn, so we could see the dust donut. The pilot, it turned out, lives near by. He looked to be about 70. He and his female passenger got out, and they and Mike and Beverly spent about an hour establishing their connections--Mike's father used to work with the pilot's uncle. The pilot used to know Beverly's first husband. Etc., etc., etc. I lost track right away, but it was fascinating to see how these Tidewater folks operate. After a while, they got back in the Robinson and flew away. Then it was time for Mike to show me his powered parachute. It weighs about 45 pounds and has no landing gear--just straps to his back. He called it the world's lightest aircraft with retractible landing gear (his legs). He said it cruises at 12 mph and that with a 5 knot wind he can take off from his front yard. Said he can climb to 6 or 8 thousand feet, shut off the engine and soar for hours. Said the longest engine-off flight he's had was over five hours, in the mountains. I don't know how much of that it true, but it made good talking, anyhow. Finally, I had to drive the 80 miles back to the suburbs.